I came across the name of this Australian writer on E. Lockhart's website. If I remember it right, she named Jaclyn Moriarty as an inspiration for the format of her own Ruby books. Of course, being as huge of E. Lockhart's as I am, I simply had to eventually check out Moriarty. 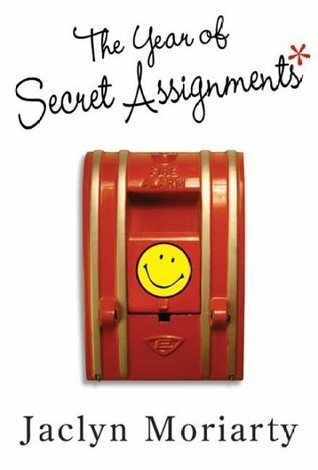 "The Year of Secret Assignments" is a book written entirely in the form of letters, notes, e-mail messages, etc. I love this format and it definitely makes the book one easy, quick and entertaining read. The story itself is pretty good too - three best girl friends are forced into correspondence with boys from a rival school. Misunderstandings, romance, fights, and adventures follow. The book is marketed as a humorous story, but I honestly didn't find it as funny as, for instance, hilarious Georgia Nicolson books by Louise Rennison. In fact, whatever was supposed to be funny, seemed a bit weird to me, especially in the beginning of the book. Maybe I simply don't get Australian humor? However, as the book progressed and serious themes of friendship, trust, and loss came into play, I started enjoying the book much more and couldn't put it down until the big "mystery" was finally solved. Overall, I enjoyed the book quite a bit. It was a nice combination of silly teenage romance, mystery, and drama. It certainly didn't change my world, but it was a nice departure from angsty paranormal YA romances I've been reading too much of lately. I will definitely give the author another try. Reading challenge: #1 - Y. Sign into Goodreads to see if any of your friends have read The Year of Secret Assignments. Do you know if he is done with that series? Or it's a work in progress?